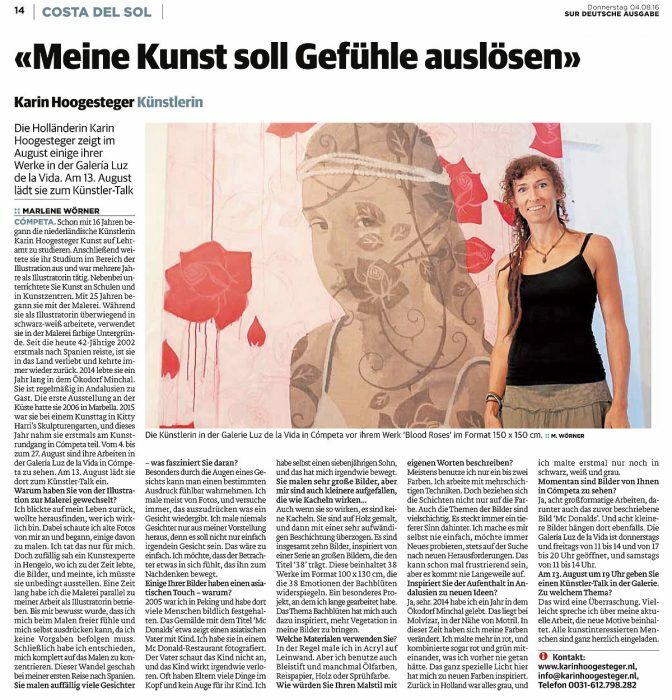 The Dutch artist Karin Hoogesteger shows in August some of her work in Galeria Luz de la Vida. On August 13 she gives an Artist-Talk. At the age of 16 years the Dutch artist Karin Hoogesteger began studying to become a teacher. After that she expanded her art studies in the field of illustration and worked several years as an illustrator. She also teached in Art at schools and Art-centres. At the age of 25 she started painting. While working mostly in black and white as an illustrator, she began painting in colors on a colorful underground. Since the -now 42-year old- artist traveled to Spain in 2002, she is in love with the country and returned several times. In 2014/15, she spent a year in the small ecovillage Minchal near the town of Molvízar. She is a regular guest in Andalusia. Her first exhibition at the costa she had in 2006 in Marbella. Last year she participated at an art event in Kitty Harri’s sculpture garden, and this year she participated for the first time at the Art Walk in Cómpeta. Currently is her work to be seen from August 4 to 27 in the Galería Luz de la Vida in Cómpeta, where she invites people to come to the Artist Talk on August 13. Why did you change from illustration to painting? I looked back on my life and wanted to find out who I really am. 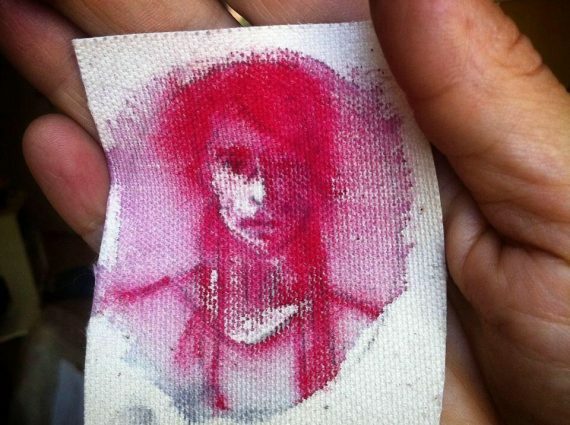 And I looked at old pictures of me and began to paint some of them. Actually, I did that just for me. 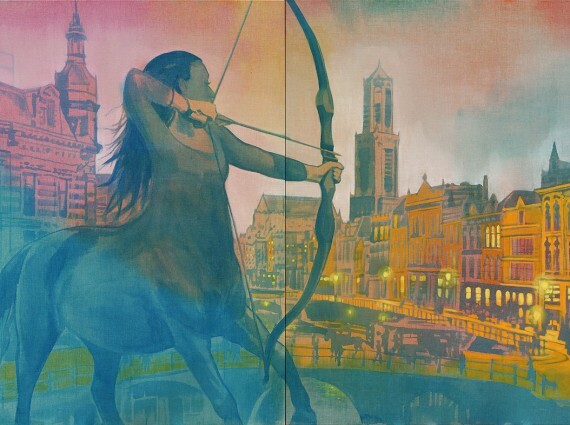 But accidentally an art-professional of the City of Hengelo, where I lived at that time, saw the paintings and thought I should definitely exhibit. For a while I painted besides my work as an illustrator. Until realized that I feel free when painting and I can express myself, because I can paint what I want without following specifications or instructions. Finally I decided to completely concentrate on painting. This insight I recieved on my first trip to Spain. You paint a lot of faces – what fascinates you? Particularly through the eyes of a face a certain feelings can be expressed. I paint mostly from photos, and always try to express what represents a face. I never paint faces only by my imagination, because I do not just paint any face. That would be too easy. I want the viewer to feel something in himself, moving him to think. Some of your images have an Asian touch – why is this? In 2005, I was in Beijing, where I photographed a lot of people. The painting entitled ‘Mc Donalds’ shows an Asian father with child. I have photographed them in a Mc Donalds restaurant. The father doesn’t look at the child, and the child somehow seems lost. Often parents have many things on their heads and no eyes for their child. I have a seven year old son, and that moved me somehow. Although they look like it, they are not tiles. The pictures are painted on wood, but then coated with a very complex coating. There are a total of eight images, inspired by a series of large images that is titled ’38’. It includes 38 works in the format 100 x 130 cm, which reflect the emotions of the 38 Bach flower remedies. A special project on which I worked a few years. The theme Bachflowers inspired me also to bring more vegetation in my pictures. Usually I paint in acrylic on linen. But I also use pencil and sometimes oil colors. I also use rice paper, wood and spray paint from time to time. How would you describe your style of painting in your own words? Mostly I just use one or two colors. I work with multilayered techniques. But the layers relate not only to the color. Also the subjects of my paintings are complex. There is always a deeper meaning behind it. I never make it myself easy and always wants to try something new, I’m always looking for new challenges. Though this can be frustrating at times, it never gets boring. Did your stay in Andalusia inspire you to new creative ideas? Definitely. During 2014/15 I lived one year in the ecovillage Minchal, near the village of Molvizar. During this time, my colors have changed. I started to paint more in red, and even combined red and green together, which I had never done before. The very special light here has inspired me to new colors. When I came back in Holland, everything was gray, and at first I painted only in black, white and gray. Currently pictures of you are shown in Cómpeta? That’s right, there are eight large-format works exhibited, including the picture described above, entitled ‘Mc Donalds’. There are also eight small paintings present in the exhibition. The gallery Luz de la Vida is open on Thursdays and Fridays, 11 am to 14 pm and from 17 pm to 20 pm, and on Saturdays 11-14 pm. On August 13, at 19 o’clock you give an artist talk in the gallery. What’s the topic? It is a surprise. Maybe I’ll talk about my current work. Which has a completely different motive. Anyway, all art enthusiasts are cordially invited. Contact: www.karinhoogesteger.nl, email info@karinhoogesteger.nl, Tel 0031-612798282. Photo: artist in the gallery Luz de la Vida, in front of her work ‘Blood Roses’ format 150 x 150 cm. View article in big format?